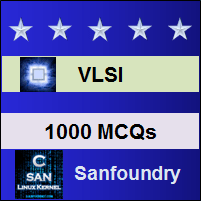 This set of VLSI Multiple Choice Questions & Answers (MCQs) focuses on “GaAs MESFET Logics”. Explanation: Normally-on logic uses depletion mode MESFETs which are ON devices and when used as switching elements are required to be turned OFF. 2. Which is the approach used for normally-off logic? Explanation: The approaches used for normally-off logic are direct-coupled FET logic, buffered DCFL and source-follower DCFL. Explanation: Since D-MESFETs are ON devices, negative voltage is needed at the gate to facilitate turn-off. Explanation: Two supply rails together with level shifting networks are necessary for proper circuit operation of normally-on logic gates. 5. In direct coupled FET logic, both depletion and enhancement mode devices are used. Explanation: In direct-coupled FET logic both the depletion mode and enhancement mode transistors are used. Enhancement mode FET is used as switching element and depletion mode FET is used as load. Explanation: In direct-coupled FEt logic, only small voltage swings are possible and also relatively small noise margins. 7. Which circuits have weak load drive capability? Explanation: DCFL circuits have weak load drive capability. This can be improved by introduction of super buffers with expense of extra area. 8. Which logic is suitable for large loads? Explanation: DCFL with super buffers are used for larger loads to be driven whereas DCFL circuits are used for light load conditions. 9. Which circuit has large noise margin? Explanation: Source follower DCFL FET logic has power dissipation and also switching delay. This has larger noise margin which is due to pull-up transistor being able to be turned off. 10. Which logic is suitable for And-OR-Invert function? Explanation: The source-follower DCFL FET logic is most suitable for realization of And-OR-Invert function which usually assists in the optimization of logical functions.